Sunday, September 3rd, Ride with the Rockers 2000 – a small turn out from the SCSC but fun none the less. The SCSC joined the Ton-Up-Boys for a ride out to the Brooklyn Pub leaving from the ECA Bar in Darlinghurst. All up there were about 40 bikes and 4 scooters making the trek. The only unfortunate incident to report was the Parking Nazi’s going mental outside the Eca Bar (presumably due to the Olympics) and threatening to book bikes for double parking. Maybe we could have convinced them they were cars with independent suspension but we just gave in a moved somewhere else. Thanks again to the Ton-Ups for inviting us along. Last Meeting, Wednesday, September 6th – Nothing of great interest at this one apart from cheap beer (see below). There was no ride out planned and people that were going to Nowra organised themselves (we’ll get a report on that next issue). Cheap Beer – The Duke are still offering cheap beer! Last newsletter we stated that we weren’t going to bother asking but the Duke have insisted that we keep up the tradition (good on them). So we now have the good fortune of enjoying $2.50 schooners of the standard tap beer. Thanks again to the Duke. Wednesday 4th October, Club Meeting – This months meeting was a bit of a disaster. The SCSC newsletter was delayed due to sickness. So nothing was organized and there were only a few people present (presumably because they weren’t reminded by the newsletter). 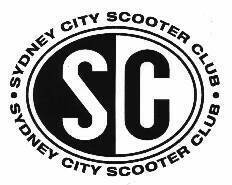 October 7 & 8 - The Atomic scooter riders club , ride to Nowra – This event has now passed. As mentioned earlier we will try and get a report on how this went down from the people that went down. Wednesday 1st November, Club Meeting – There will be a ride out next meeting to Watson’s Bay. Leaving at 7:30 sharp from the Duke to sit on the bay and have a beer and chips at Doyles. Day Ride, Sometime in November – If you didn’t read the above properly… we are deciding at the next meeting a Day Ride to have during November.